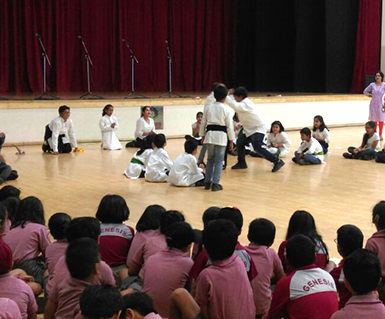 Sports is an integral part of the curriculum and at GGS we can’t imagine it any other way. The Multipurpose hall was built mainly for indoor sport when, in some months, the temperature outside is not conducive for our students. The 1,10,000 sq ft, fully air conditioned structure has a distinctive feature in its various levels being utilized for different purposes. 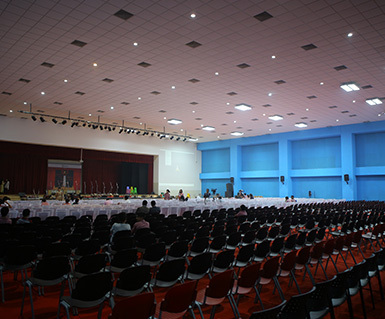 The Ground floor, which is used as the School auditorium, has the Capacity to accommodate more than 1500 people; the morning assembly is held at this location. The rest of the floors offer a wide spectrum of indoor sports such as Gymnastics, Squash, Basket Ball, Net Ball, Fencing, Badminton etc. While the rooftop houses special synthetic Tennis courts.